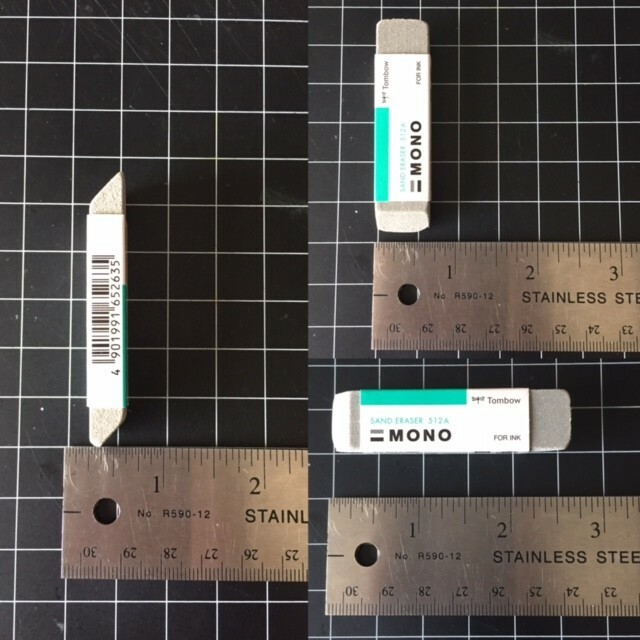 I don't know about you, but I have been hearing a lot about the Tombow Mono Sand Eraser, everyone is using it and it honestly seemed to be too good to be true. Like one of those things where we all like the rest of Tombow's products so why wouldn't this one fall in line as well? So naturally, I had to get one and test if for myself. I purchased the "Tombow Mono Sand Eraser 512A for Ink". I tested this using my 8 most frequently used mediums for card making. I will post the before and after photos and then I will go through each and discuss what I found. Below, on the left is my tester sheet. I used 110lb Copic-friendly cardstock. I chose this cardstock because it my primary choice for card making and felt that since I would be using this the majority of the time it should also be the one that I use for testing. On the right, I have the exact same sheet after using the eraser. I attempted to make each of the marks as though it were "accidentally" done through regular use. 1. Ball Point Pen: An accidental scuff with a regular blue ball point pen should pose no problems. The sand eraser takes the light scuff right off with very little damage to the paper. 2. Pencil: Comes right off. I'm not sure why you would choose to use the sand eraser over a regular white eraser when it comes to getting pencil off, but you never know, so I thought I'd include it. 3. Zig Clean Color Real Brush Marker: (Deep Green) This took a lot of effort. A very light scuff should be no problem but if you drop the marker tip down (we've all done it) you may have to cover it or start again. 4. Tim Holtz Distress Marker: (peacock feathers) This eraser won't help you. As you can see above I was unable to get much of this marker off the page at all. There was substantial damage to the page and the results were not worth it. 5. Memento Tuxedo Black ink: We've all scuffed a stamp or gotten ink on our fingers. Provided you didn't drop the entire ink pad face down on the paper, this eraser should help you. I was able to get the light scuffs off, with very little effort and very little damage to the paper. 6. Copic: There's no hope. Because of the way Copic markers work, I didn't expect the eraser to yield any results. 7. Black Glaze Pen: Will remove the light smear with very little damage to the paper. And honestly, who hasn't smeared an eye at least once? 8. Pigment Liner: (Staedtler Pigment liner 0.3) medium damage, removes tail. Overall, I'm rather impressed with this product. It also removes most coloured pencil provided you are working with decent quality paper, it also removed glitter pen from my clear Gelly Roll Stardust pen. I found it worked best when I held it upright and only used a tiny bit of pressure, working in small circles. That reduced the amount of damage to the paper. Because of the amount of dust the eraser leaves behind during use, I found that wiping it away won't help the situation, use a loose brush or tip and tap the piece over a garbage to remove the grit. I hope you liked today's review. If you haven't all ready, please follow me over on the right side bar so you don't miss any future reviews or projects. If you are viewing this via mobile device, scroll to the bottom and click "View Web Version" first. You can also follow me over on Facebook. If you have any questions about this review, or have a suggestion for a future review, toss me a line in the comments section below and let me know. I would love to hear from you. *Disclaimer: I am not sent products for review, nor am I paid to review them. I review the products that I find interesting and that I purchase myself, with my own money and I receive no incentive, reward or payment to do so.